A legendary sneaker, ideal for leisure, discovery, exploration ... A new shoe to adapt to your Flaneurz rolling part. Vans was founded in 1966 by Paul Van Doren, James Van Doren and three other partners,all passionate about extreme sports. The legendary Vans Sk8-Hi, created in 1978, is inspired by the classic Old Skool. 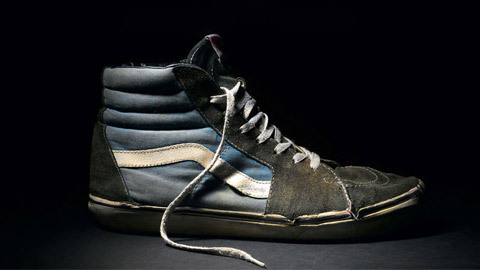 It is known and recognized for its iconic side stripe, which is the hallmark of the Sk8-Hi model. This pair features a resistant canvas and one suede upper, padded ankle and vulcanized waffle sole. The Vans Sk8-Hi Reissue Delft flows across the vintage style in a modernized aesthetic. Designed by and for the skateboarding community since the end of the 1960s, Vans quickly become an icon of the streets and created a craze for the “on wheels” community (skate, roller skate, BMX). The alchemy Vans / Roller skate exists since the end of the 70s : it comes from a collaboration with the roller skate manufacturer ACS, at the origin of the first Vans roller skate (not detachable). Today, the international skatepark rollergirl group “Ckicks in Bowls” made of Vans Sk8-Hi the symbol of the return of the quadskating in the skatepark.